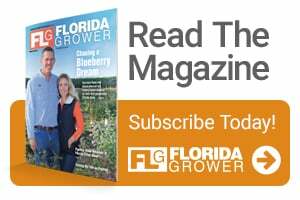 As Florida citrus growers still recover from the stress stirred up by Hurricane Irma and continue to cope with citrus greening, University of Florida scientists are encouraging the use of a complete and balanced nutrient program in their groves. The citrus nutrient recommendations come after many researchers have worked together, amassing years of data, according to Tripti Vashisth, an Assistant Professor of horticultural sciences and UF/IFAS Citrus Extension. “Mineral nutrition plays a vital physiological role in the growth and development of a plant and as well as in plant-defense response,” Vashisth stated. Preliminary studies by UF/IFAS researchers suggest that increasing the supply of micronutrients can be beneficial. It is shown that many micronutrients act as the catalyst in physiological reactions such as plant-hormone biosynthesis and regulation as well as in plant-defense mechanism. Through the state legislature-funded Citrus Initiative, Vashisth has found leaves from greening-affected trees often show deficiencies in certain nutrients such as manganese, zinc, iron, and more. This suggests that, because of greening, more of these are required and are critical for diseased plants’ survival. A constant supply of nutrients is important, and controlled release fertilizer (CRF) and fertigation are two methods to ensure that supply. In the case of CRF, nutrients are coated with either clay or a polymer that causes the nutrients to be released in the soil and the roots over time, rather than all at once. The thickness of the coating determines the length of the release. Some growers combine CRF with traditional soluble dry fertilizer, and they are achieving good results. Some growers are applying liquid nutrients through their irrigation system or via drip-lines. Fertigation allows to apply nutrients in small dose with irrigation and the nutrients become readily available to plant. These recommendations are based on findings of an ongoing fertilizer field trial funded by Citrus Research and Development Foundation. That trial has shown that by applying 20% to 50% more micronutrients through the soil, and by using controlled-release fertilizer, scientists can improve tree yield significantly, Vashisth confirmed. Vashisth went onto point out that applying the nutrients in the nitrate form seems to be working very well, although some growers are applying nutrients in the oxide form. Nitrates are most easily taken up and utilized by the trees. Fellow UF/IFAS citrus researcher Jude Grosser concludes growers do not need to change the amounts of primary nutrients – nitrogen, phosphorus, and potassium – that they are using.